Some random photos we took of one of the towers of the Montlake Bridge and the Statue of Lenin in Fremont. The Thunder Creek trail was our first hike of the season. We went about 15 miles roundtrip starting at the Colonial Creek campground (near the amphitheater – map location) and reached Tricouni Camp and then turned around. It took us about 7 hours to do that with a half hour lunch break and a couple of stops to talk to people (especially the people with the llamas!). Actually there really weren’t that many people on the trail and almost everyone we saw was hiking in the reverse direction coming out from days of camping. The trail is a relatively flat. It was mostly in shade and cool at least for this day in May. We saw no snow. During the hike there are few times you actually get close to the river. If you can wait, there are some good picnic spots along the river about 5.5 miles in from Colonial Creek. 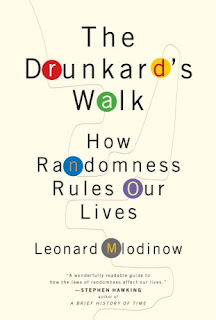 Recently, we both finished reading The Drunkard’s Walk: How Randomness Rules Our Lives by Leonard Mlodinow. It is a thought provoking book about how much randomness impacts our lives and how we often attribute its effects to a host of other causes. The book was a bit difficult at times to understand and the misprints (in our particular edition) didn’t help. 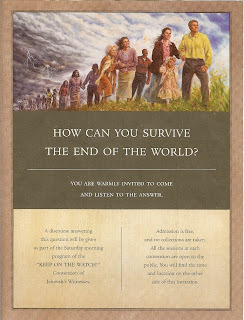 There are just two concepts I’ll point out form the book (for now). The first is a calculation doctors were asked to make of breast cancer. In a nutshell the question is what is the probability that an asymptomatic woman between the ages of 40 and 50 who has a positive mammogram actually has breast cancer if 7% of mammograms show cancer when there is none, the actual incidence is 0.8%, and the false-negative rage is 10%. This problem is discussed in Chapter 6 False Positives and Positive Fallacies. After many hours we were able to calculate that a positive mammogram is due to cancer in only about 9 percent of the cases. I suppose it was an exercise left to the reader. The 9% comes from the following logic (we believe). The sample space of (test, actual) is (Postive, P), (P,Negative), (N,N), (N,P). Let’s say 1,000 women is the sample group size. (P,N) = 7% of 1,000 or 70. (P,P) = 0.8% - 10% of 0.8% of 1,000 or 7.2. (The false-negative rate means that if 0.8% out of 1,000 or 8 have it, there will be 10% of those or 0.8 that are (N,P)). (N,P) = 0.8. So 7.2/(7.2 + 70) = 9%. 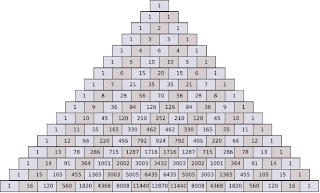 The second concept is Pascal’s Triangle. I never had been exposed to this before and found it fascinating and an easy way to calculate how many ways to select a subset of items from a larger set where order of the items is not important. Suppose you want to know how many ways to extract a subset of 4 items from a total set of 6 items. Just go to 7th row (or the 6th row if you start counting from the top at zero). Starting at the left square you find there is 1 way to arrange 0 items of 6 total, 6 ways to arrange 1 item, 15 ways to arrange 2 items, 20 ways to arrange 3 items, and 15 ways to arrange 4. So the answer is 15. This is also called a “n choose k” problem – how to find how many combinations thare are of n items taken k at a time. If you don’t want to write out the Pascal’s Triangle for larger number you can use the binomial coefficent (which the Pascal Triangle entries represent). The binomial coefficient is n! / (k! (n-k)!). So for the problem above we have 6! / (4! (6-4)!) = 6! / (4! 2!) = 6*5 * 4! / (4! * 2!) = 15. I was dividing a cast iron plant (Aspidistra elatior) that has been in the ground for many years with the aim of giving a clump to some friends. I was surprised to see what I think is the flower (pre-bloom or post-bloom? )– having never observed the flower in all these years. Compare the above photo of what I observed with a Curtis’s Botanical Magazine image here. After several weeks we are finally able to start making salads from our salad garden. 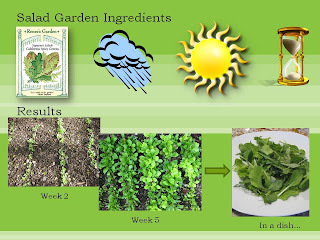 We planted Gourmet Mesclun Salad / Asian Baby Leaf and Signature Salads / California Spicy Greens from Renee’s Seeds. So far, we are happy with the results. We’ll see how long we can keep harvesting it.